I've always kind of taken it for granted that pumpkin pie is made with canned pumpkin-- it's quick and easy and has never let anyone down. Even though it's generally agreed upon that "from scratch" food is best, it turns out there's some disagreement about whether it's worth it to make fresh pumpkin purée for use in pumpkin pie. Some bloggers swear by the fresh taste, while others claim that Libby's canned pumpkin is the gold standard. I had to see for myself and made two pumpkin pies—one with canned pumpkin and the other with fresh pumpkin— to taste side-by-side. To make enough fresh pumpkin purée for a nine inch pie, I used two 2-3 pound pie pumpkins, which are sweeter and smaller than your standard jack-o-lantern pumpkins. I preheated my oven to 300 degrees F, then cut the top and bottom off of the pumpkins and split them in half top to bottom. With a metal spoon, I scooped out the guts and seeds (holding onto them for roasting later!). I lined a baking sheet with aluminum foil and placed the pumpkin halves cut side down onto the sheet. After roasting them for about 45 mins in the oven, I pulled the skins off and threw the pumpkin meat into a blender, blending for a few minutes until completely smooth. Two 2-ish pound pie pumpkins yielded about two cups of fresh pumpkin purée, which is about the same as a 15 oz can of canned pumpkin. For the taste test, I used the exact same pumpkin pie recipe, save for using canned purée in one and fresh in the other. Since I knew which pie was which, I enlisted the help of a friend in blind taste-testing them. The most apparent visual difference between the two pies and purées was in their color. The canned pumpkin produced a pie with the classic "pumpkin orange" color that we know and love, while the fresh pumpkin pie was a much paler orange. In terms of texture, we both agreed the canned pumpkin was uniform and dense, while the fresh pumpkin had a velvety, light, and pleasant sweet potato-like texture. Although I honestly couldn't tell much of a difference on the first bite of each pie, I began to notice a metallic aftertaste in the canned pumpkin pie while the fresh pumpkin had a much more pleasant finish. 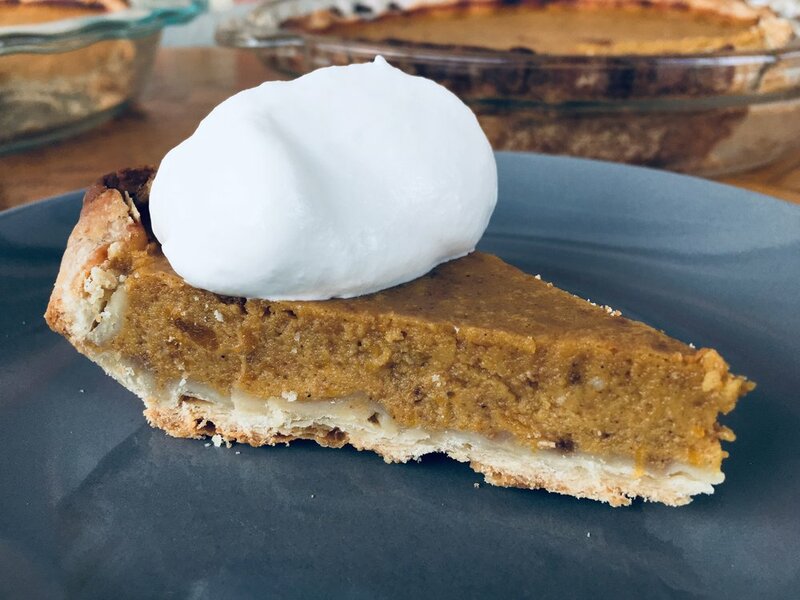 Overall, the freshness of the pumpkin was apparent, which allowed us to actually taste the pumpkin, as well as the spices that had gone into the pie, and it was obvious even in the blind taste test. The canned pumpkin pie was more muted and muddled in its flavor, but it was still a perfectly decent pie. A can of Libby's canned pumpkin costs about $2-3 dollars, while pie pumpkins run about a dollar a pound or more. A nine inch pie requires about $4-5 dollars worth of pumpkin, so the difference between the two preparations is about $2-3 dollars. It doesn't get much easier than just opening a can for pumpkin purée. On the other hand, making pumpkin purée at home takes about an extra hour. Other than the time, most of which is inactive, the actual preparation for the homemade purée is fairly straightforward and just involves cutting, roasting and blending some pumpkin. In the end, I'd say it depends on the circumstances, but that generally it's absolutely worth it to make fresh pumpkin purée for your pumpkin pie. It's not difficult, doesn't take too much longer, and the difference in taste and texture is well worth it. Admittedly, if you're not doing a side-by-side comparison, and especially if you top your pie with whipped cream or ice cream, it may be harder to pick out the differences between the two. Some people may also prefer the canned pumpkin taste for nostalgia's sake. In a pinch, or just for convenience's sake, canned pumpkin will produce a perfectly good crowd-pleasing pie. Otherwise, if you're someone who notices and appreciates the differences in using fresh product, I'd highly recommend going through the extra effort. Cut off top and bottom of the pumpkins, and split each pumpkin in half, top to bottom. Scoop out seeds and fibers with edge of metal spoon. Line baking sheet with aluminum foil and arrange pumpkins cut side down on baking sheet. Bake for 45 minutes to an hour, or until a fork easily pierces through the pumpkins. Allow pumpkins to cool for 5 minutes and remove the skins using a fork and knife or by hand. Transfer skinned, cooked pumpkin to a blender and blend on high speed until completely smooth and processed. Note: If purée is watery, let sit in paper-towel or cheesecloth lined colander for up to an hour to drain. Cover pie shell snugly with aluminum foil or parchment paper and fill with dried beans or pie weights. Blind bake for 12-15 minutes. Remove pie weights and aluminum foil or parchment paper and bake for another 5 minutes or until golden. Combine sugar, spices, and salt in small bowl. Whisk together eggs and pumpkin purée (2 cups if fresh, one 15 oz can if canned) in large bowl. Add dry ingredients to wet and mix to combine. Slowly pour in evaporated milk, stirring continuously, until fully incorporated. Pour pie mixture into partially baked pie shell. Cover exposed edges of pie crust with aluminum foil to prevent burning. Bake at 400 degrees F for 45-50 minutes. The center should be slightly wobbly but nearly set. Transfer to wire rack to cool for 2 hrs. Top with whipped cream and serve immediately or cover and refrigerate.